During the evening of Monday, January 15, 1923, SPD Sgt. L. W. Miller was contacted by Mr. Walter C. Rouff. He told Miller he had been walking downtown when he was approached by two men and asked if he wanted to assist them in committing a $1,000 robbery. One of the men was wearing a sailor’s uniform. Around 11:15 p.m., Sgt. Miller met with Officers Arthur Luntsford, 44, and G. D. Bilodeau at 1st Ave. and Pike Street. Miller instructed the officers to take Rouff with them, and go find the suspects. The officers started towards 1st Ave. and Pine Street. When they reached that intersection, Rouff pointed out two men across the street, and told the officers they were the men who had approached him. Luntsford and Bilodeau went across the street and arrested the two. Neither suspect was searched for weapons. One suspect was George H. Gilman, 35. He was wearing a sailor uniform. Gilman was a former boatswain’s mate on the Coast Guard cutter Bear. The other suspect was Carl Thorkelsen, 23. According to Officer Bilodeau, he was leading Thorkelsen back across the street. Officer Luntsford was about ten feet behind him with Gilman. Bilodeau heard several shots. He turned and saw Luntsford falling to the street. Gilman then shot himself, and fell to the street. Several witnesses stated that, after shooting Officer Luntsford, Gilman fired shots at Bilodeau before shooting himself. Gilman had pulled a .38 pistol from his pocket and shot Officer Luntsford three times. Luntsford suffered gunshot wounds to the right side, right forearm, and back. Officer Luntsford was rushed to City Hospital. Gilman died at the scene. 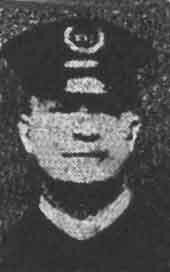 Officer Luntsford was transferred to Swedish Hospital on January 16th, and he died January 21, 1923. Officer Arthur Luntsford was survived by his widow, Katie, and their daughter, Gertrude. His funeral was held at Bonney-Watson on 1-24-1923, and he was buried at Washelli Cemetery. Carl Thorkelsen was jailed after the shooting. He was released after Walter Rouff told officers he was not the man with Gilman when Rouff was asked to assist with a robbery. Following the shooting of Officer Luntsford, Seattle officers were told to have their pistols in hand when they approached all suspects, and to immediately search all suspects for weapons. Arthur Brighton Luntsford was born on 9-18-1878 in Ionia, MO. At age 2, the family lived in Nebraska. In 1889, the family settled in Lincoln County, Washington, where Arthur grew up. On 9-22-1901, Arthur married Katherine “Katie” Rouse in Lincoln County. Their daughter, Gertrude, was born in 1902. The Luntsfords moved to Seattle in 1917 where Arthur worked at a Seattle shipyard until he was commissioned as a Seattle police officer on 2-18-1919.